tone wrote: where is the (1020x1020) textures of forever 7th capital located? i have a question regarding difference between versions. does the chinese version got censored too? thank you，help me https://n.163.com/ Netease Games DAT model. I was able to finish my tool, thanks to AceWell figuring out the encryption key. Now it can load the skeleton too. Also it seems to work fine with Onmyoji and Crusaders of Light too, at least for the mobile versions. Load your file/folder from the "File" menu. Select the model from the list. 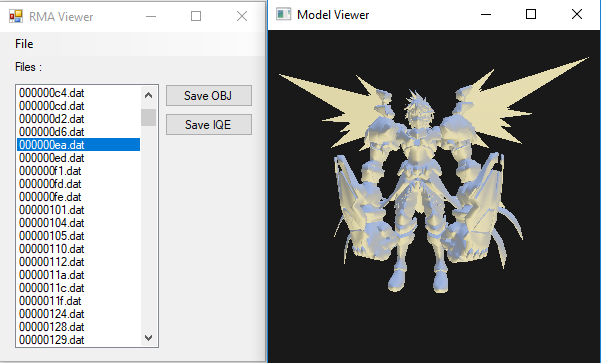 Export it as OBJ or IQE (skinned). For getting the textures read the posts below. That game uses a different model format. It would require a whole new program. I have no plans to work on that game atm. It also uses .dat files. I can get the model from it, using your program, but am unable to find the textures. I'll leave one of the npk files I found in the game data here, in case someone is able to help find where the texture file is hiding. Because after extracting, there is a whole bunch of files that I have no idea the purpose of, so in order to ensure that nothing is left out that could help with the search, I'll just leave the whole file here. Last edited by kotaxzz1 on Sat Feb 02, 2019 3:00 pm, edited 1 time in total. kotaxzz1 wrote: export with nothing when try to extract model or texture from Million Arthur. Can you preview the model and only have problem with exporting? Better post a small sample because I can't help much without seeing what you are trying to load. The tool doesn't export textures. sorry for that, it just my bad , your tool work correctly. There was someone writing the script for this game, but it was not complete, could you help renovate it ? ?There was someone writing the script for this game, but it was not complete, could you help renovate it ?? lxxxk wrote: thank you，help me https://n.163.com/ Netease Games DAT model. kessa,,a wrote: could you help renovate it ?? Sorry, I am not interested in that game. kotaxzz1 wrote: EDIT : My bad. how do you do that, i can't find the texture file anywhere, is it included on the .dat file?